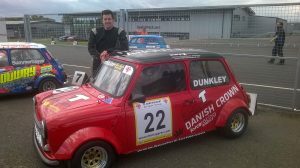 Sharp-aX Limited has sponsored Willersey Provisions‘ Director James Dunkley, for the 2017 MG Midget Challenge Club season. The races take place at Donington Park, near Castle Donington in Leicestershire. The Donington Park motor racing circuit was the first permanent park circuit in England. Willersey Provisions has been a Sharp-aX customer since July 2015. They use the Sharp-aX software system and are now setting up a new integrated website.